For everyone who likes to drive and is coming from central Europe may take the ferry from Germany to Sweden or Denmark. However, most of our guests choose the way Denmark - Norway. The ferry Hirtshals - Bergen is 19h and is slightly more expensive. However, the journey from Bergen to Balestrand is a breeze of about 3 hours. 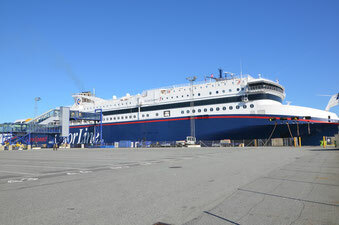 The Hirtshals - Larvik ferry is about 4h short and mostly quite a bit cheaper, but is associated with an approximately 9-hour journey on to Norway. So it is up to you which direction to go to. An arrival from Kiel (Germany) to Oslo is of course also possible, the ferries her have an luxurious cabins. Those who book early can sometimes grab a bargain. We can also warmly recommend the overland route via Denmark, Sweden and Norway. The Oresund Bridge brings you directly from Copenhagen to Malmo (Sweden). Lufthansa and SAS fly to Bergen and Oslo from various airports in Germany and Europe and generally have the most affordable prices. The only drawback here is that you may have a little restriction on your luggage, so maybe not quite as much food and drinks as you may usually bring. But if you comes maybe only for a week, I can only highly recommend this way from the airport. Just use a rental car and off you go. 3hrs 30 mins and you are at the Villa Sognefjord. + the house can be found behind our little sign on the right of the street. You will see a little bus stop on the right and a downward way just infront of it. That is the way leading to the house. 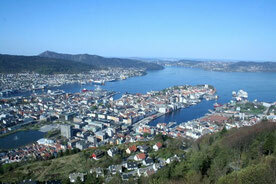 From Bergen you can reach our house in 2 different ways within 3 -4 hours by car. One route along the E16 heads in northeast direction, and passes the Ski region of Voss and the famous Vikafjell. A spectacular ride. At the end of the journey across this mountain route you will reach the village of Vangsnes on the opposite side of the Sognefjord. You will by then already see Balestrand. The ferry takes you then from Vangsnes via Hella to Dragsvik..
From there it is only another 10 minutes to the Villa Sognefjord. At the roundabout, in Dragsvik do not turn to the left (Balestrand), but right towards Førde and Gaularfjell! The second option is to head up north along the E39 and Oppedal.. Here the ferry will take you to Lavik. After the crossing you will reach the Villa in nearly exactly 2hrs going along the Sognefjord which lies on the right side of you. So keep straight! Torsnes 15 is located 20 minutes outside of Balestrand and at the Sværefjord framed by majestic snow-capped mountains and crystal clear fjords. Travelling to us from Oslo takes ca. 7-8hrs and goes along the E16 heading North crossing a mountain terrain and the famous Hemsedal region. Here you need to take 2 ferries. The first ferry is the Fodnes - Manheller. Landed on the other side in Manheller drive towards Sogndal. There it is important to search for the direction Balestrand / Leikanger (Rv55). One roundabout behind the town centre will give you the option to turn left and you will then reach the ferry in Hella This will take you to Dragsvik. From Dragsvik it is only 10 mins to the house. At the roundabout in Dragsvik turn right towards Gaularfjell and Førde and you will be with us in a flash!